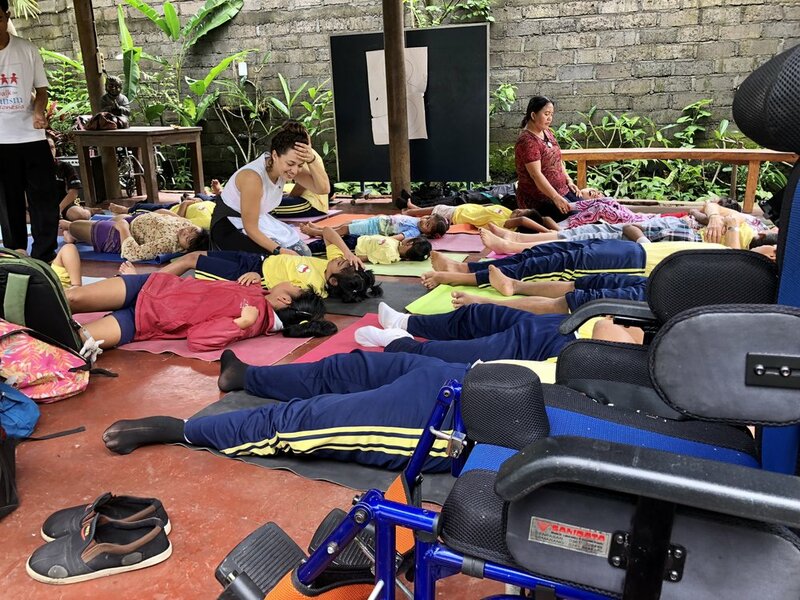 Practicing yoga with the wheelchair group and the deaf/mute/blind children, truthfully, I was very nervous about my own inabilities and shortcomings. "How will I communicate? What if they don't understand me? What if they don't LIKE me?!" all ran through my mind. Very quickly, these beautiful children taught me more than I could have ever imagined. With sincere smiles, loving hugs and vibrant energies they welcomed me just as I was. It was clear, this was so not about me. When one faculty or sensory function is absent or limited, we are off balance. Yoga and meditation provide an equalizing opportunity to celebrate our strengths, build a relationship with our current limitations and join together in breath and heart. 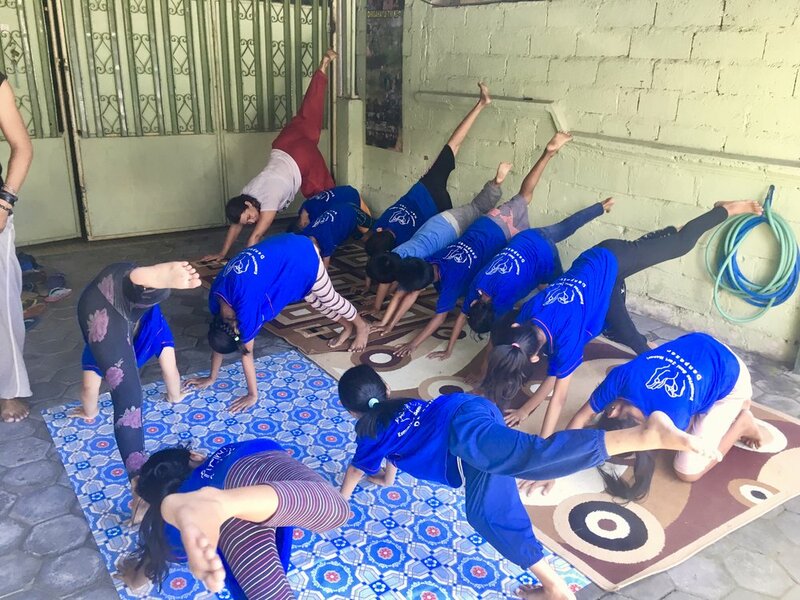 I've spent most of my volunteered time teaching yoga, meditation and breath-work to a variety of at-risk or marginalized communities in Bali including deaf, blind and mute children, wheelchair bound adults and orphaned children with a wide berth of special needs. Here's a small sampling of recent charities and communities I've been spending time with. This special Ubud community grew from 8-98 children with financial details displayed for visitors on a large board. Each individual kid has an account built from donations and income created by their unique arts and handicraft projects. Operating completely by donations of time, energy and funds, the children are provided with housing, physical development aids, proper education, uniforms,english and chinese lessons as well as Friday Fun days where you see me teaching yoga and meditation here! Widya Guna would benefit greatly from donations to provide access to wheelchairs, funding for school supplies and donation of energy at meal time to help kids eat who. A weekend activity program for deaf, mute and blind students between ages 5-10. With a missing or limited sensory function, children likely have a challenge keeping mental focus and physical balance. Yoga and meditation help build positive connection from our minds to our bodies. The parents of the these sweet kids also attend the weekend activities and have taken a keen interest in learning and incorportating our yoga practice at home, especially during homework and rest times. YCMU's mission is to create a learning/training centre and residence to empower its members to grow more independent - physically, professionally, financially and spiritually. It supports its members by providing a purpose-built space for people with disabilities to come together, allowing them to feel safe, nurtured and supported. It also provides a central hub in the Ubud / Gianyar region for creativity, learning, opportunities and exchanging ideas between members and the broader community. This incredible community would benefit from funding for wheelchair upgrades, art supplies, organic garden materials and volunteers. Jon Rose developed this water filter program with one mission in mind "Get clean water to every single person who needs it." - $50 filter is hygienic, practical and literally saves lives. See pic - Carting bucket and filters to an orphanage currently without capacity to provide the all the children with meal time water at the same time. Click here for more ways to support!